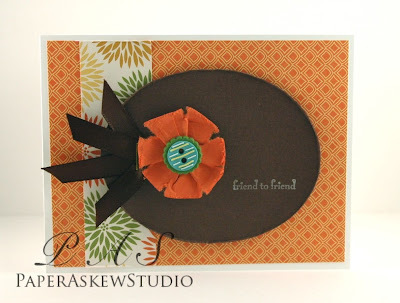 I had a few scraps of orange card stock laying around so I thought I would try to make a flower. I just scrunched and turned every couple of scrunches then taped it together. I then added an adhesive button to the center to finish. I had this Chocolate Chip oval left over from my "Eat Cake" card, (from a couple of posts ago) and these two ends of ribbon from yesterdays card sitting around. So I guess you could say this is a completely scrappy card, made from all scraps! Groovy! Tomorrow I will have some matchboxes AKA nugget boxes for you. Don't forget to play along with the "nugget box" challenge over at 3D Design Challenge. You have a chance at a gift certificate from Penguin Pants Stamps!!! You only have until tonight though to turn it in (9PM MST) so hurry and get your link posted over there! !